The Asian defence News Blog: Has Pakistan Signs Deal with China to Co-produce Six Subs With The Technology that India Wants? Has Pakistan Signs Deal with China to Co-produce Six Subs With The Technology that India Wants? Even as India has announced its intent to have new generation diesel-electric submarines, Pakistan has gone ahead and signed a deal with long-standing ally China to produce submarines with the same technology that India wants. The Pakistan Navy and China’s Ship Building Corporation signed a deal that got the seal of finality during the visit of Chinese Premier Wen Jiabao to Pakistan last December. Indian security agencies in know of the matter have cautioned the government that this could tilt the balance in favour of the Pakistan Navy in the Arabian Sea. India is looking to spend Rs 50,000 crore to acquire six new diesel-electric submarines that will be equipped with air-independent propulsion (AIP) technology to boost operational capabilities. Conventional diesel-electric submarines have to surface every couple of days for oxygen to recharge their batteries. A submarine using AIP technology can stay submerged for 12-15 days at a stretch, thus increasing its capacity to hunt down enemy warships without being detected. Nuclear powered submarines can stay underwater for even longer periods. Under the latest agreement, China will co-produce six AIP technology submarines with Pakistan. Currently, the neighbouring navy has only one submarine -- PNS Hamza. Pakistan is also looking at an AIP system produced by a French or German maker to fit on to the Chinese made hull of the vessel, said an official. What is worrying for India is the known pace of Chinese construction. China could well provide three-four new generation AIP technology submarines to the neigbouring country within two years. The Chinese had supplied four frigates to the Pakistan Navy in 18 months flat! The two nations have also co-produced the single-engine J-17 fighter that was inducted into the Pakistan Air Force last summer. For India, it could take upto five years to induct its first such submarine, as it will have to go through the process of trying out offers from various global bidders before ordering the vessels. The Indian Navy has a bigger fleet in terms of number but it is dwindling and will be down to eight conventional diesel-electric vessels by 2015. By then, the first of the six under-construction Scorpene submarines will join the fleet followed by five more till 2018. The AIP technology vessels will follow later. Going by estimates, Pakistan would complete the induction of its fleet of AIP technology vessels by the time India starts off with its line of such submarines. However, India will maintain its edge over Pakistan in case of nuclear-powered submarines. 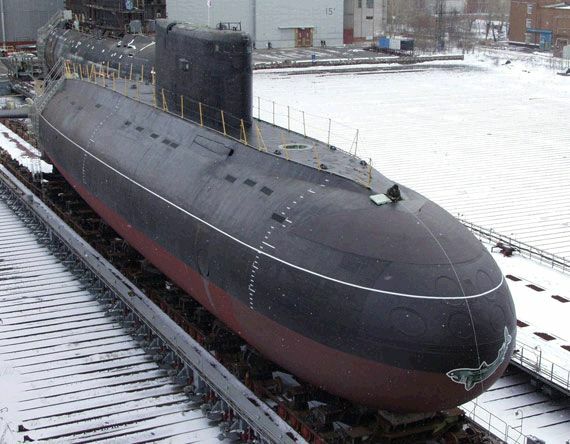 It hopes to induct the Akula-II Class attack submarine K-152 Nerpa on a 10-year lease from Russia in the next few weeks while the first indigenous nuclear submarine INS Arihant is expected to be inducted by early-2012. Indian Navy Chief Admiral Nirmal Verma has already declared that nuclear-powered submarine INS Arihant would be on ‘deterrent patrol’ to provide the ability of a retaliatory ‘second strike’ if the country faces a nuclear attack.